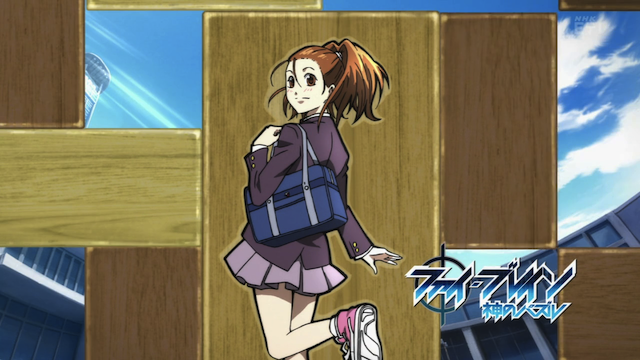 New eye catch from the second season of Phi Brain. For those who have not been following Phi Brain, you might not realize that it had a very interesting soundtrack, with a variety of styles, but notably some tracks that had a Middle-Eastern (or perhaps North African) influence. The second season of Phi Brain is continuing, but this post is about the OST for the first season. I don’t have a lot to say about it, but I did want to point out a few tracks, so that those who aren’t familiar with the series can get a feel for why the OST (composed by Akio Izutsu) is worth checking out. This is a good example of what I was talking about above. It almost sounds like some sort of Moroccan music, mixed with Jazz, mixed with Hard Rock. Hearing tracks like this when Kaito and his pals tried to solve puzzles was great fun. This one is basically composited samples with a solid beat. Most tracks on the Phi Brain OST are pretty short, with only 5 of the 35 tracks clocking in over three minutes. This gives the opportunity to provide a large variety of moods. This particular track is very short, atmospheric, and a bit on the pensive side. This song has a Dub-Ska feel. I’m not sure what that has to do with the school that Kaito and his friends attend (Root Academy), but it is a fun cut. One of the longer cuts, this song has a darker, moody feel than most of the album. I like the combination of acoustic guitar with bowed cello. There are also electric guitar harmonics, strings, and some sort of bell. Finally the ED from the first season. It is sung by Natsumi Kiyoura Sketchbook ~full color’s~ and Spice and Wolf in the past. Of course the OST also has the killer OP Brain Diver by May’n, but I figure you’ve already heard that one. I hope this little sampling gives you an idea of how interesting the music was for this series, and maybe convinces you to check it out. Akio Izutsu seems to be a newcomer composer, so hopefully we’ll get to hear more great music from him in the future! Someone else who noticed what a great soundtrack Phi Brain has! Thanks for the clarification! I guess we can welcome him to the world of anime soundtracks then. Akio Izutsu needs to compose more anime OSTs, because his work with Phi Brain was excellent. There are so many different genres there, and it all feels so different from the usual stuff used in anime. Yes, quite excellent, and, as you say, very fresh. A VERY welcome addition!